Fluctuations in weight, growing older and heredity can cause your upper arms to take on a drooping, sagging appearance. This condition cannot be corrected through exercise. 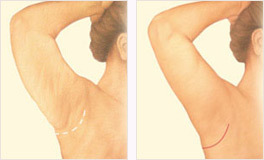 An Arm Lift, or Brachioplasty, reshapes the underside portion of the upper arm from the underarm to the elbow. Arm Lifts are performed to reduce sagging skin, tighten and smooth the underlying supportive tissue that defines the upper arm shape, and reduce localized pockets of fat. You may be a candidate for an arm lift if the underside of your upper arms are sagging or appear loose and full due to excess skin and fat. A consultation with the plastic surgeons of Hedden & Gunn Plastic Surgery at our Birmingham, Alabama cosmetic surgery center can help you decide if an arm lift is right for you. Adults with significant upper arm skin laxity. Adults of any age whose weight is relatively stable and who are not significantly overweight. Healthy people without medical conditions that impair healing or increase surgical risks. Non-smokers with a positive outlook and realistic expectations. By choosing a member of the American Society of Plastic Surgeons (ASPS) for your arm lift procedure, you can be assured that you are choosing a highly-trained, board-certified plastic surgeon. ASPS Member Surgeons must meet rigorous standards for training, ethics, physician practice and research in plastic surgery. Discuss the likely outcomes of arm lift surgery and any risks or potential complications. Be sure to ask questions at your consultation. It is very important to understand all aspects of your arm lift. It's natural to feel some anxiety, whether preoperative stress or excitement about your anticipated new look. Don't be shy about discussing these feelings with your plastic surgeon. The decision to have arm lift surgery is extremely personal. You will have to decide if the benefits, risks and potential complications of an arm lift are acceptable. Damage to deeper structures such as nerves, blood vessels and muscles. Fatty tissue under the skin might die (fat necrosis). Numbness or other changes in skin sensation. Sutures may not absorb, but spontaneously surface through the skin, causing irritation, drainage and redness. These risks and others will be fully discussed prior to your consent. It is important that you address all of your questions directly with your plastic surgeon. You will be asked to sign consent forms to ensure that you fully understand the procedure. Your arm lift may be performed in an accredited office-based surgical facility, ambulatory surgical center or hospital. Be sure to arrange for someone to drive you to and from surgery and stay with you for at least the first night. Anesthesia choices for arm lift surgery include intravenous sedation and general anesthesia. Your doctor will recommend the best choice for you. Incision length and pattern during arm lift surgery depend on the amount and location of excess skin to be removed as well as the best judgment of your plastic surgeon. Incisions are generally placed on the inside of the arm or on the back of the arm, depending on the surgeon's preference, and may extend from the underarm (axilla) to just above the elbow. Excess fat may be directly excised or treated with Liposuction. Depending on your specific conditions, incisions may be more limited. Underlying supportive tissue is then tightened and reshaped with internal sutures. Finally, the skin is smoothed over the new contour of your arm. Your incisions will be closed with absorbable sutures or stitches that will be removed within 1 to 2 weeks. Medications to apply or take orally to aid healing. Specific concerns to look for. Following your arm lift, dressings or bandages may be applied to your incisions and your arms may be wrapped in an elastic bandage or compression garment to minimize swelling. A small, thin tube may be temporarily placed under the skin to drain any excess blood or fluids. Will I have dressings/bandages after surgery and when will they be removed? The smoother, tighter contours that result from arm lift surgery are apparent almost immediately. Initial results will be obscured by swelling and bruising. Arm lift results are long-lasting provided that you maintain a stable weight and general fitness. It is natural to lose some firmness as your body ages, but most improvement should be relatively permanent. A scar will remain where the incision was made. Although good results are expected from your arm lift, there is no guarantee. In some situations it may not be possible to achieve optimal results with a single procedure and another surgery may be necessary. 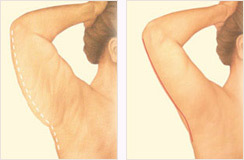 Brachioplasty: A surgical procedure, also known as an arm lift, to correct upper arm sagging. Liposuction: Also called lipoplasty or suction lipectomy, procedure that vacuums out fat from beneath the skin's surface to reduce fullness. Local anesthesia: A drug injected directly to the site of an incisio to relieve painn during an operation. Arm Lift at Hedden & Gunn Plastic Surgery smooths the contours of the upper arms by reducing sagging skin and tightening the underlying tissue. Please contact us today if you have any questions about reshaping your upper arms with an Arm Lift at our Birmingham, Alabama plastic surgery center.